Hope you all having a great Friday and have an even better weekend. I am so excited for this fragrance to come to our South African shores. If there was ever a girly sophisticated flirty fragrance then this is it. Juicy Couture is launching their new fragrance which fits among holiday editions perfectly, thanks to its composition and flacon design. 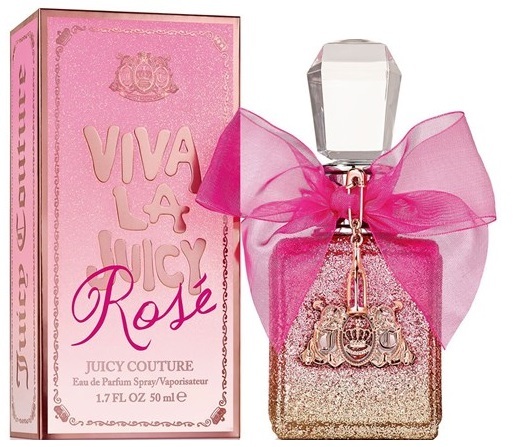 Viva La Juicy Rose is the most gorgeous fragrance bottle i have ever seen. Its a pink and gold ombre glitter glass bottle, topped with a large crystal topper, a huge pink tulle bow and a small champagne bottle charm. Sparkling. Charming. Exuberant. Celebrate the season with Viva la Juicy Rosé, a light-hearted toast to the forever vibrant Viva girl. Dressed in sparkling pink, she experiences the world through Rosé colored glasses. This effervescent fragrance pops with fizzy citrus perfection. It sparkles in a dew of Jasmine and Rose honey-like blossoms for a dreamy scent that is kissed by the glow of sensual Amber. Cheers! The fragrance is aimed at modern girls who see the world through pink glasses and enjoy pink, glamorous and glittery dresses.